If you and your family enjoy spicy foods, this easy skillet dinner is sure to please everyone at your dinner table. 1. In a large skillet over medium-high heat, cook the ground beef and onion until meat is no longer pink and onions are tender; drain. 2. Add the water and bring to a boil; stir in pasta. Cover and simmer over medium heat until pasta is tender; about 10 to 15 minutes. 3. Stir in the soup, green chilies, olives, salsa, salt and pepper; cover and simmer until hot and bubbly. 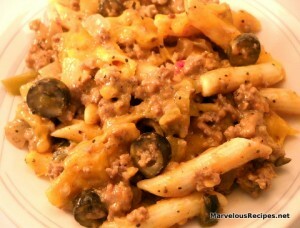 Remove from the heat; sprinkle cheddar cheese over meat mixture. Cover and let stand until the cheese is melted. Makes 6 servings. I could make this without the chilies, it sounds so comforting!